See all BSJ posts for more info. See my Flickr set for far too many photos of this, including yarn and fiber. I spun up three different colorways of Merino wool for this jacket, approx. 140 yards of green, 80 of blue, and 100 of the brown, and used all but a few yards of each. They’re all 2 ply worsted spun from commercial top that I hand-dyed. I did what I was told. No mods, except the increases. I used my preferred method of picking up the strand between stitches and knitting into the back. I liked the way the decreases looked from the wrong side, so when I sewed the jacket up, I did so with the wrong side (well, there is no wrong side, but the side I didn’t increase and decrease on) facing out. From this view, you can see the cast on edge across the bottom. Here it is flipped over, with the cast off edge at the bottom. Starting to inch things into position. Folded and ready to seam. I was taken by surprise by how thick the fabric is. It’s also super cushy, as the yarn is already bouncy and lush and adding garter stitch to that makes it feel beyond wonderful. When I picked up along those 10 lengthening ridges, from the right side I picked up the front half of the edge stitch, twisting it as I knit it. When I picked up from the wrong side on the next row, I picked up the back strand of the edge stitch and twisted it. The resulting stitches look the same in the right side of the work. I didn’t do any edgings. With this particular yarn, which has a rustic, organic feel, I thought plain was best. I love the i-cord edgings I see on some. Next time. Have I missed anything? Ask away if you have a question. I’ve been getting lots of emails about this, so instead of answering privately, I’ll just add to this post. Thank you for all your kind words about this project! Adrian this is stunning. is has a very organic feel for it. lovely. and coconut buttons – seals the deal! Lucky baby that will wear this! 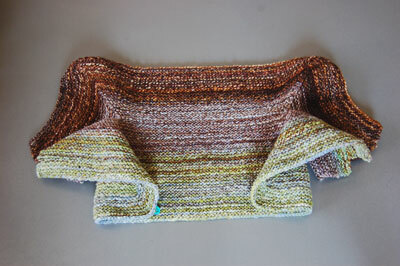 What a great way to ‘showcase’ your beautiful handspun yarns. What a great sweater, I love the rustic appearance. Looks great! 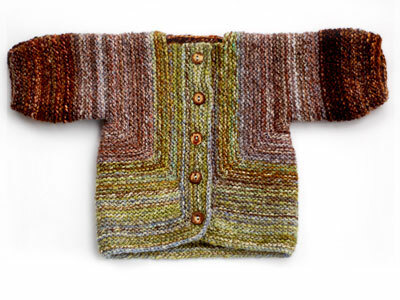 What a terrific project for handspun! A work of art! The whole concept is so ‘rustic’, yet so delicate and beautiful. I love it! I love how this came together! I also love that BSJ is like a canvas for knitters — folks create such unique and distinctive versions of the same pattern. Wow. That jacket is the most beautiful little jacket I have ever seen! I love that this is a garment for a baby, yet it’s still dignified, not overly cute. The colors & yarn are so beautiful. Good job! I agree – the prettiest baby surprise jacket I’ve seen. I love the yarn you spun for this piece. It makes the FO even more special ::sniffle:: Cute! what a great idea for handspun. I’m a fairly new spinner and i’ve finally grown accustomed to my new Ashford Joy DT. I was thinking about what can i knit to use up all these scraps of worsted weight handspun. You did a beautiful job! it’s a lucky baby indeed who gets this absolutely gorgeous jacket! Wonderful job! About the woman from Windsor Buttons, she’s incredible! I was there once when some lady was looking for an obscure button, and she took one look at it and new exactly where it was and what colors they had. Quite a talent! We’re twinsies! Congrats on such a beautiful jacket, and I can’t wait to see project #2! Suddenly the stripe placement on the BSJ on my needles makes sense! That is the most perfectly rustic baby jacket ever. I LOVE it! I didn’t really like the jacket until I saw yours, now I dig it totally. Must. Make. One. This is spectacular! I’m really impressed, it’s so beautiful. A great way to show off both your knitting and your handspun. Honestly, that is too cute for words! I’ve been admiring your BSJ, but am reluctant to use yarn that has to be hand-washed. Can you suggest a superwash yarn that will give a similar effect? Sooo beautiful! What a great pattern and the yarn was an excellent choice! Congratulations! I love it. It’s lovely. ooooooooh… I am totally in love. What a gorgeous jacket! It looks cushy and snuggly – perfect for a baby. The colours you chose are amazing as well :). 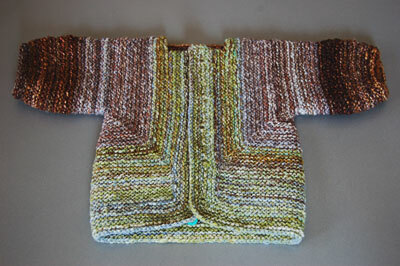 I absolutely love this jacket, really beautiful yarn combination! It’s perfect in every way, a jacket that will be treasured. GOREGOUS!! I’m a brand new spinner, and would LOVE to try something like that someday. Very inspiring. what a great project for little snippets of yarn! it is so rustic and homey looking! So, so cute! I love the way you used your handspun. Totally gorgeous! This has to be in my top 5 of most beautiful knitted objects. I can’t stop looking at it. The only thing that would make it better would be to see it in person, so I could squish it for myself. You were absolutely right to not add I-cord. It doesn’t need adornment of any kind. I love your Baby Surprise Jacket! So gorgeous. I need to make stuff for some friends’ babies so I should get to spinnin’ on your hand-dyed fiber! Yours turned out beautiful. I think I have been lurking and watching you knit this for awhile. It’s gorgeous. It makes me want to spin up some beautiful yarn to make one for my baby! Of course, I am still a beginner spinner and don’t really have faith in my abilities yet. oh my goodness! that is one of the beautiful things i have ever seen! those are all of my favourite colours…and together, it is just perfect! 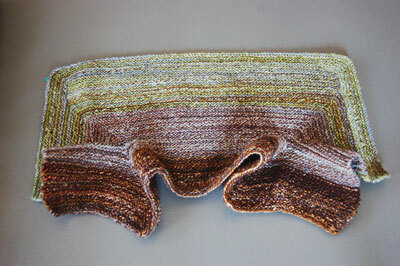 People all over the world are now checking their handspun stashes. Now I totally want to make another one. I just love feeling like a magician when I fold the blob into a sweater! That’s adorable. Agree completely about the edgings (or lack thereof)–it’s perfect as-is. GASP! Gasp, gasp! Oh, wow, the colors and … oh… it looks stunning. I am stunned. I love the jacket! It looks great with your handspun and it looks like it was fun to knit. It is going to go on my “to knit” list now. Hi, I’m knitting this jacket too at the moment and have hit a snag. I reached 152 stitches and cast of 5 at beg of next two rows for neck as instructed. The next instruction happens at 158 st. but as you are increasing 4 in a row, 152+4=156, not 158? When you come to pick up your stitches again after working 10 ridges on the centre 90 st, it instructs you to pick up 34 st from your needle. I don’t have 34 st on my needle becuase I just cast off 5! I’m so hoping you’ll have time to help me. I’ve put maxium effort into thi jacket, I would hate to fall at the last hurdle. Many thanks. It’s okay, the penny has just dropped! Thanks anyway. I love it! 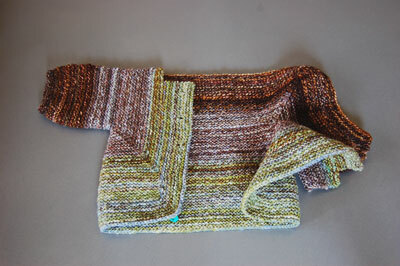 Your yarn is gorgeous and perfect for this project. One of the most beautiful BSJs I’ve ever seen. I never seem to remember when your yarns go on sale so am constantly suffering yarn jealousy! Cascade Super Wash Wool. It works like a dream!